If you want to build a custom bike there is no shortage of well-worn paths to go down, a Triumph Café Racer, a Harley Tracker or an XS650 Bobber. The aftermarket parts are available, the internet full of inspirational photos and there are even shops that will make you a turn-key example. 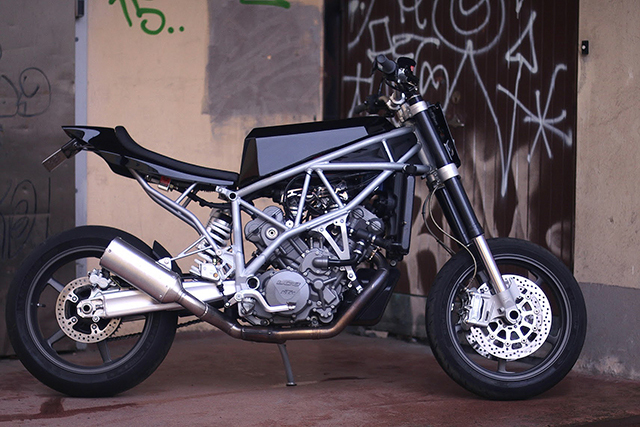 But Olof from Sweden’s Mod Moto didn’t want to build something already “done by everybody else seven thousand times”. So he went past left field, took a turn down a boggy lane and continued all the way to a KTM 950 SM. 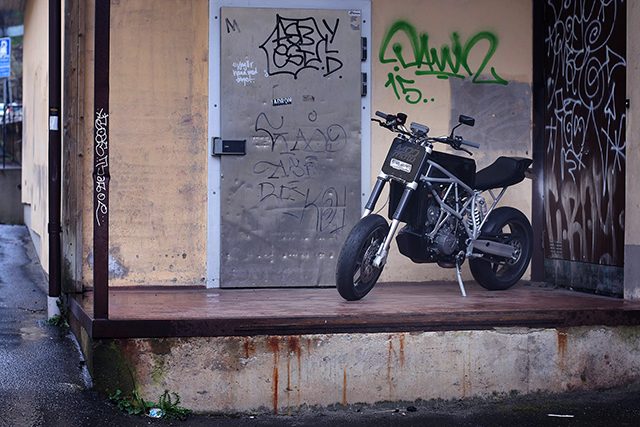 One of the ugliest bikes in recent memory that upon its release many journalists at the launch believed would never sell, one comparing it to the exact opposite of Charlize Theron…, that was until they rode it. 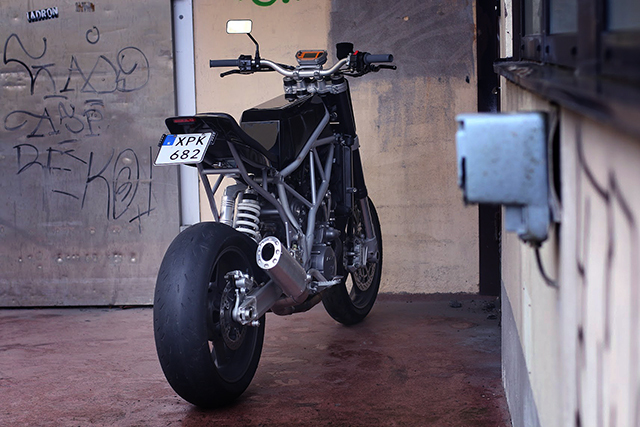 “The KTM 950 SM may well be the best-feeling, most capable, most intoxicating day-in, day-out street bike we have ever tested” fawned a motoring journalist, turns out Olof is a man that can look past looks and see a kind heart. And what a heart it is, 942cc of KTM V-Twin, with 4 valves per cylinder, gobs of torque and 100 wild ponies ready to be let loose at the crack of the throttle. To extract a little more fun Olof ditched the emissions gear, fitted a new air filter and rejetted the carbs to suit. From here you’d probably want to start throwing serious money at the KTM to get the looks up to scratch, but there was just one issue. Not only had Olof chosen a left field bike he’d set himself a budget of well, zero! So all the unused parts and plastics, lights and fuel tank were sold off to fund the remainder of the build. With no other tank on the market ever going fit the frame and a zero dollar budget Olof grabbed some cardboard and started to shape up a minimalist design that would give the bike a cleaner look. Matching the angles of the frame, the templates were then transferred to steel, bent to shape and finally welded up by good friend Ulf. To give the KTM a tracker look Olof bought an XR seat pan, but the bulky subframe was never going to do it justice, so using a borrowed pipe bender he cleverly fashioned a new one that mirrors the mainframe only in smaller diameter tubing. With the seat now bolted down the look is both functional and infinitely more appealing than the standard fare. The stock exhaust is a twin pipe, twin muffler setup and just like the stock look its hideously ugly, not to mention heavy. So Olof built a 2-into-1 system and then neatly cut down an old slip on can, repacked and riveted it together and shortened the remainder of the system to give a low slung look. 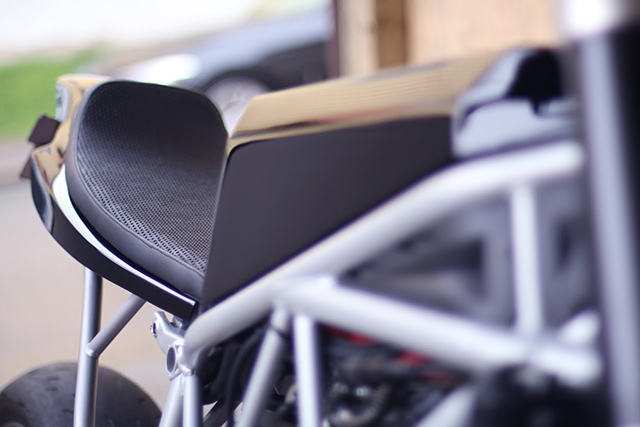 A smartly designed hanger then runs off the new subframe, all of which frees up the entire back end creating wonderful negative space to highlight that wide sticky rear tire. 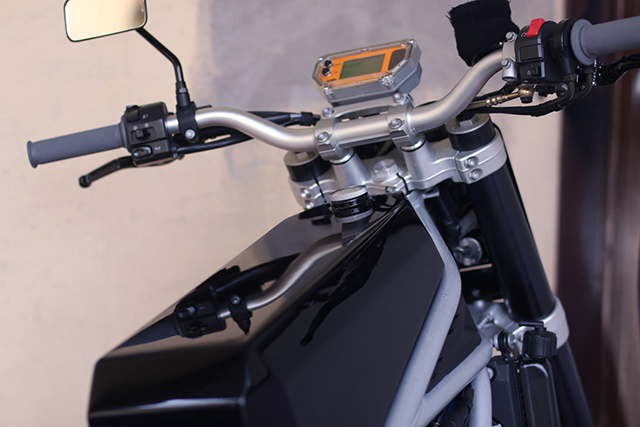 The front headlight is a small item placed in the lower half of a dirt bike front plate, while the wiring has all been neatly hidden away. Tucked under the tank are the battery and the remainder of the electrics, with new grips and CNC levers giving Olof precision control. 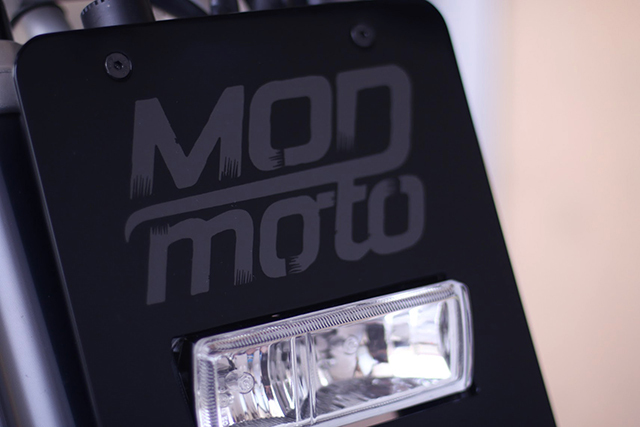 Finally good friend of the team Dennis came in to lay down the purposeful gloss black paint and the all important, yet subtle, Mod Moto Logo. 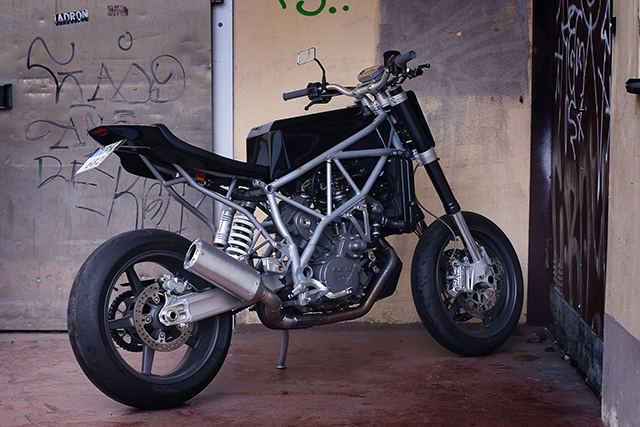 At first look you probably thought “What is that?” second inspection and you’re beginning to appreciate the vision and skill needed to transform a standard KTM 950 SM into something so worthy of a Pipeburn feature. 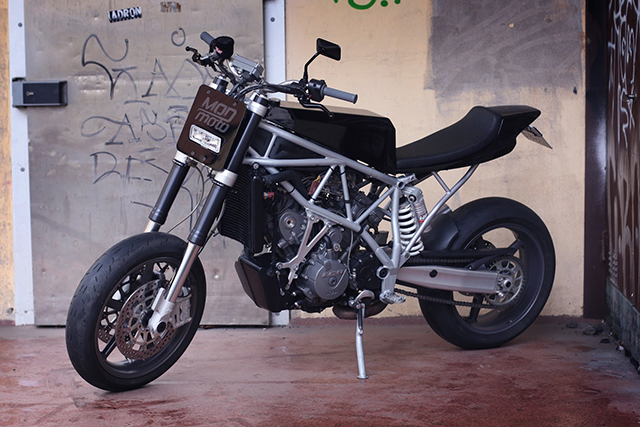 But then jump aboard this purpose built machine and you’ll be riding one of the fastest and most fun custom built bikes ever to assault the urban jungle! And isn’t that why we bought bikes in the first place? !